Our aesthetic sensibilities seem by some measure to be rooted in ideas of symmetry. 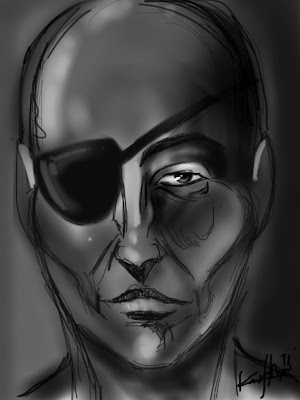 The eye patch is something that interrupts that symmetry, but the intriguing thing about it is the notion that behind this black is something interesting - I guess it illustrates to power of finding balance between symmetry and mystery. The tough thing is to get the rest of the proportions of the face correctly...I would say, meh in terms of drawing, but I will probably revisit this.